Has your building or property got structural stabilisation problems? If yes you have come to the right place, here at London Structural Repairs we are a company of structural repairs experts with a wealth of experience in dealing with structural instability in period and modern buildings. We often use a repair technique called bed joint reinforcement. This is basically a helical bar and grout system installed in the bed joint of the masonry to help strengthen and spread structural loads. We use bed joint reinforcement to create masonry beams above lintels, windows, door openings and to help with subsidence stabilisation in certain circumstances. There are a few companies that provide us with the bed joint reinforcement bars and grout with Helifix and Thor Helical that are both leading companies in the industry that supply these products. Engineers and Architects contact us regularly with their bed joint reinforcement designs that have drawn up to stabilise structural instability and restore structural integrity. It is often cheaper and less inconvenience to clients by using this repair method. We use specialist diamond twin bladed machines to a predetermined depth attached to a powerful dust extractor to remove the mortar beds for a dust free cut before the installation of bed joint reinforcement. People that ask us to carry out structural repairs stabilisation works are home owners, property developers, loss adjusters, property management companies, engineers, architects and surveyors. 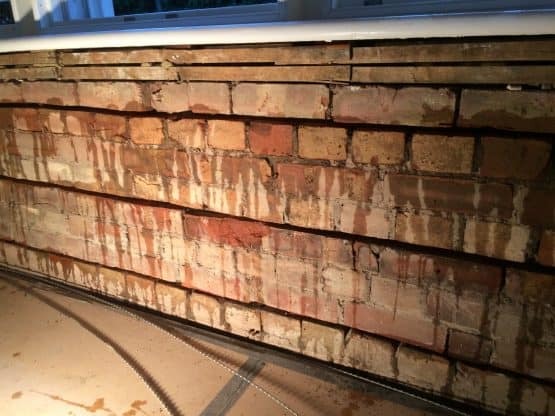 Here at London Structural Repairs we have to deal with lots of structural repair situations on a daily basis, check out our services page to see a comprehensive list of services we have on offer to anybody that needs help with structural repairs issues in and around London. If your property is in need of Bed Joint Reinforcement or any other structural repairs stabilisation the contact us for a free quote. © 2014 London Structural Repairs LTD. All rights reserved.